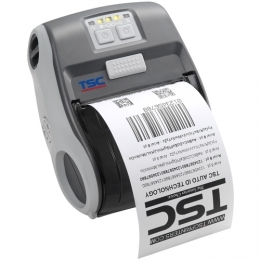 The mobile direct thermal printer Alpha-3R is the first model in the portable printer family from TSC. It is highly practical and easy to handle, especially if you are looking to replace handwritten sales slips and payment receipts. The Alpha-3R delivers the performance you expect directly on-site. With its powerful 2,500 mAh battery it operates for up to 12 hours on one charge. Optimal for payment receipts, parking vouchers, transportation tickets, etc. Simply attach it to your belt and print receipts up to 80 mm wide with this lightweight. Thanks to its fast 32-bit RISC processor, 8 MB RAM and 4 MB Flash, it delivers quick results it prints at a speed of up to 102 mm/sec. so you can avoid unnecessarily long waiting lines. Its double-walled plastic housing with a rubber casing endures a lot in combination with the optional protective cover the Alpha-3R withstands falls from 1.5 meters, plus it is protected against dust and liquids IP54 rating. It comes standard with a USB port Wi-Fi, Bluetooth and RS-232 are optionally available.